The « all-in-one » instrument for sizing, quantifying and determining the Zeta potential of your nanoparticles. Direct tracking of particles is possible in a size range starting from 10 nm(1) up to 3 µm. Estimate with accuracy the concentration of your samples within a large scale going from 105 to 1010 particles per cm³. Determine the Zeta potential of particles and their stability in a given environment. 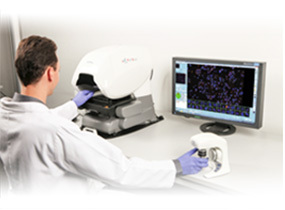 The ZetaView is a robust instrument, easy to move if needed and fully operational within minutes. By design, the ZetaView need very few handlings, and extremely small acquisition and analysis time allowing to process tens of samples a day. The use of a validation standard in addition to comprehensive and easily understandable integrated statistical analysis tools guarantees robust analyses.